It is a field service management tool developed to digitize the FSM domain to the highest extent possible and make the process amply efficient. Along with a mobile app to deal with field-side troubles, QuikAllot promises comfort and excellence. Speed, quality and precision are the key focuses of this software. Real-time task tracking is one of the main benefits. With this software powering your venture, no paperwork will be required with its seamless data storage facilities. Just a few clicks will help fetch the task details and assign them to the respective executives, all within minutes. The various projects you get can be managed efficiently from the portal. Task scheduling takes no more than a few seconds to do with QuikAllot powering your venture. The Outlook integration powering this tool allows you to load task requests automatically from emails. Tracking of task location, status and time are done easily and in real-time. It allows you to monitor the task status and executive location at all times. Keep an eye over the jobs and their respective time through timesheets. QuikAllot isn't limited to a particular type of venture. Every industry, small and big can employ this software and get stellar results. 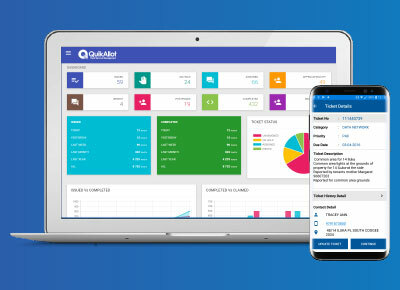 Be its delivery services, HVAC maintenance, plumbing or carpentry, cleaning services, as long as your business needs a tool to manage tasks and field executives, QuikAllot is your go-to software. Get your hands on the absolutely tremendous QuikAllot software, ready to equip your venture with the finest of field management services. Book a free demo now and see for yourself!